Imagine having audio and video in every room of the house. The way that we access content has drastically changed. Now, much of the content we watch is recorded on our DVR, on-demand, or streamed over the Internet. Imagine, starting a show in one room and finishing it in another. Instead of every room having it’s own cable box, it’s own Blu-ray player, and it’s own apple TV, all of your boxes can be installed in a single location and shared with any TV in the home. With a few taps on your smart phone or tablet, you can access all of your content and have it playing in whatever room you choose. We have solutions for any home and will design and install your system to deliver a high-quality experience. Multi-room audio video distribution systems can be done in new construction, and can also be retrofitted for most existing homes. 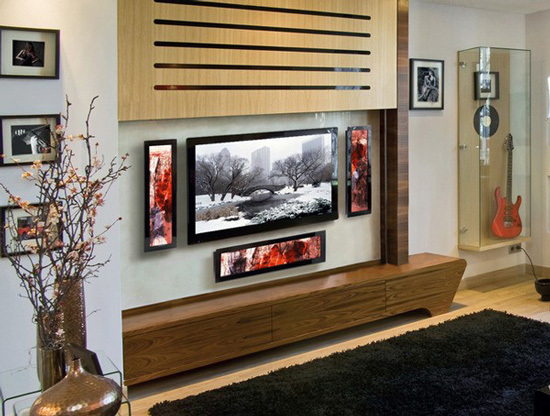 By using a whole home audio video distribution system, you have more elegant design possibilities. You can locate all of your equipment in a remote location. You can then place speakers and video displays inconspicuously wherever you like in your rooms, and use a keypad in the wall of each room to control the system. Parties become easier and more entertaining. Have you ever tried to fill a house with music, and had to have the system so loud it drowned out all the conversation? With our systems, you can go to the keypad, touchscreen or ipad in each room and adjust the source and volume accordingly. Or if you like, with a one-button push, the entire home music system can be shut off. Many systems now allow you to start out with a basic whole home audio video distribution system and expand it later to include the convenient home automation features of lighting control, climate control, camera control, and much more!